How did an Air Force chaplain from Abilene, Texas, wind up at the second Atlanta residency for Grand Canyon University’s College of Doctoral Studies? He was linked in by LinkedIn – but not in the way you might expect. Bryan Cottrell had just changed Air Force bases, from Davis-Monthan in Tucson to Dyess in Abilene, when he decided to start looking for a doctoral program in the hope of improving his job security. “Part of the thing with the military in the last few years is that they’ve been cutting, cutting, cutting, and you never know where you stand until they tell you they don’t want you anymore,” he said. Cottrell was in the process of asking around when, completely unrelated, he got an email asking him to connect with someone on LinkedIn. When Cottrell went to the LinkedIn site, there was the banner ad for GCU’s doctoral program. Fast forward a few weeks, and Cottrell joined 144 other doctoral learners at the March 10-14 residency in Atlanta. The first residency drew 55 attendees last April. 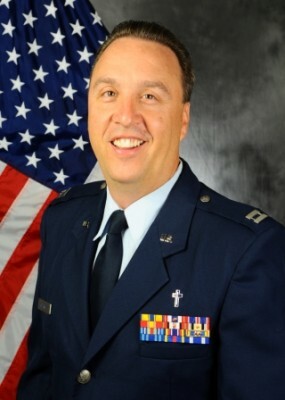 Cottrell appreciated the one-on-one time he got in helping to formulate a plan for his dissertation, “Leadership in the Air Force Chaplain Corps.” It also helped him feel more at home when one of the speakers there was Dr. Robert Krell, a retired general who is a CDS faculty member and dissertation chair. Cottrell has a good reason for his dissertation subject: He said the Air Force is planning to make some fairly major changes in how its chaplains do their jobs, and he wants to be better prepared for them by interviewing other chaplains. “The Air Force won’t ask us what we think (before deciding). That’s not how they do it. But we have to figure out how to implement the changes,” he said. While Cottrell liked what he saw in his first GCU residency, even more telling was the perspective of Mary Trickel, who also attended the first-ever Atlanta event a year ago. Trickel, who’s 73 but talks with youthful enthusiasm, loved the 2013 event but had two suggestions for improvements and was thrilled that both were heeded. Anissa Villegas, residency coordinator for CDS, said the on-site sales were made possible through a partnership with Georgia Tech. Trickel’s other idea was to make sure that first-year students got hooked up with people in their second year to be able to glean insights, and that happened, too. It only confirmed to her why she’s such a GCU fan. GCU also has an ambassador in Abilene after Cottrell’s experience, but he’s about to become an ambassador on the other side of the world. In three weeks, he starts a six-month deployment in Afghanistan, where he plans to use what little spare time he will have to continue his doctoral research. “You can’t exactly tell your boss, ‘Sorry, I’m not available right now. I have studying to do,’” he said. Cottrell’s work there will be entirely on the base. The only time he will go outside the fences is when he is traveling between bases, but there is one challenge he will face in addition to the obvious dangers. The Atlanta residencies are proving wildly popular. Not only did GCU expand from one in 2013 to three this year; Villegas said the next one, scheduled for July 28-Aug. 1, is already at the 150-person capacity. The dates of the third residency are Nov. 10-14. “The fact that we went from one pilot to three residencies this year shows that we responded to need and to learner feedback,” Villegas said. I totally agree with everything that was said about the experience in the Atlanta doctoral residency program. I, too, was happy to get the insight about some things prior to taking some of the classes in which they said I would need the information for. It was far from a vacation as some people quickly learned. It was also nice to meet people that you had or were currently taking classes with, as well as meeting local people where you were from with the hopes of connecting up again beyond this experience. The instructors were awesome, too! I just wish we could have cloned the two we had — Drs. D’Urso and Skelton!! Thanks again, GCU, for coming to Atlanta! !